If you are looking for great painting products, then take a look at the The Paint Store. They offer a wide variety of products that will make your do it yourself painting project go smoother. They have been in business for years. We would trust them above some of the other local stores because their expertise is with paint. They know everything there is to know about paint, painting products and color consultation. Plus, they are giving away free shipping on all orders that are $99 and over. Make sure you check out their deals. You want be disappointed with their service. Their customer service is top notch. Below is a snippet about their mission and branding. Also, you can check out their store as well as take advantage of their free shipping. Their Mission- It is to offer professional name brand paint & painting supplies online, at the lowest prices. Most of their products are made in the USA. Whether you are looking to buy one brush or several cases of paint supplies, ThePaintStore.com is your one stop source for paint & painting supplies. List of painting tools and accessories: paint, paint brushes, paint rollers, painting tools, paint buckets, paint roller trays, painters clothes, caulking guns, caulk, spackle, patching, drywall tools, putty knives, airless paint sprayers & parts, razor knives, paint scrapers, masking tape, painting tape, masking paper, sand paper, sanding sponges, drop cloths, painting rags, faux finishing supplies, safety products, ladders and much, much more all from the top brands. Friendly Service- If you need any help narrowing down your selections, then give them a call. We could help but to notice this great deal by Sherwin-Williams. 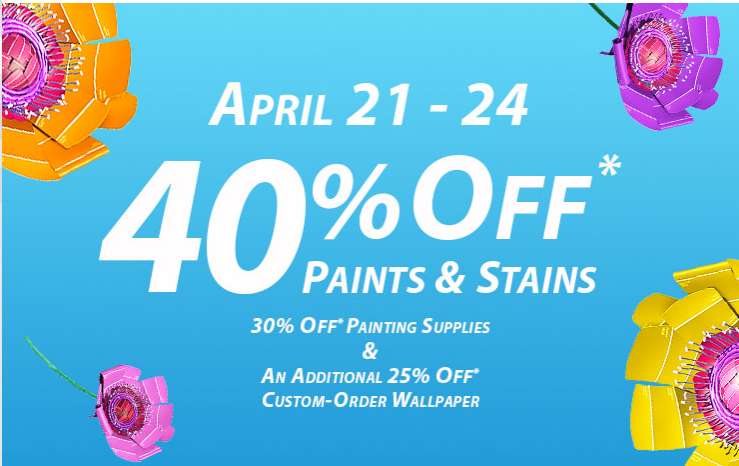 40% off paints & stains. You will not find a better deal for this upcoming weekend. Below are the details. Make sure you call your local Sherwin Williams store to verify they are having this sale. 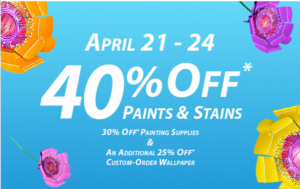 Sherwin-Williams offers this sale at least once a year and it will save you a ton of cash particularly if you are painting your whole house. Particularly, since we are in Colorado, if are looking for Fort Collins painters, then make sure you ask them if you can use Sherwin Williams paint on your home so that you can get this discount. Sometimes you will find these painting companies will work with you to use your paint. You will be able to save a ton of money on your painting cost if you use this deal with your painting company. Make sure you ask your painting company if they will let you bring your paint. Tell them that you found a deal and that you couldn’t pass it up. Also, if you have been on the fence about hiring a painting company due to cost, then perhaps this will get you going. Most exterior painting jobs are around $3500-$4000. With a deal like this, you can probably knock off $500 to $700 of cost. Not a bad deal indeed. If you are looking for a great price on a great painting product, then take a look below at this Behr deal that Home Depot is running right now. Normally, the cost is around $35 a can. You can save almost $10 per can. This is well worth looking into with your upcoming painting project this year. It is a great painting product because it includes paint & primer. Normally, the cost of primer is a little under $30 plus the cost of your paint which runs around $35. So with this combination you can save almost $35 per can. Think of the savings you will have if you are painting your own home. Also, think about the time you will save if you can combine both primer and paint together. No need to repaint. It is a great deal. Make sure you check it out. $26.97- BEHR Premium Plus Zero VOC, Self-Priming Interior Semi-Gloss Enamel is 100% acrylic, provides a mildew resistant finish and is great for cabinets and trim. This sheen resists stains, moisture and wear; provides ultimate durability and exceptional hide. The finish displays a radiant, sleek appearance. We tend to focus only deals within the painting realm However, many people have asked us for links that would help them save money in other areas. Below are some places that you will find coupons or deals that will better help you save money on lots of different things. Let us know if you have any suggestions to help our readers. We are glad to be able to use this blog as a means of serving people who focus on doing it yourself. Several years ago, we were looking for ways to paint our house. We started looking at different ways to paint our house. Should we hire a professional painter? Should we do it ourselves? After deciding to do it ourselves, we felt like there was a ton of information that we needed to know to get moving. However, we were having a difficult time finding the information that would help us save our resources and time. We hope that you will enjoy this blog. It is meant to help you as you think about painting your home. 5% off Any Spring Exterior Painting Project over $4000. Are you thinking about painting your home this Spring? Put aside the brushes and the headache that comes with painting your home. Hire professional painters who will make the job go smoothly. Professional painters give you the flexibility and skill to allow you to approach the painting season with ease and less stress. Check out our 5% off offer for a project that is over $4000. Not to be combined with any other offer. Project must be accepted within 7 days of receiving proposal with signature. Project must be started within 30 days. Offer valid from Castle Rock CO painters.